Overview of where to log in, what settings are available, and where to find pending notifications. Now that you have a registered and approved account on your website, you can manage your member settings, account settings, make online payments, take surveys, and more! Below is an overview of how to get started. Before accessing restricted pages and exploring your website, you'll need to log into your member profile. To do this, click on the "log in" link in the upper right-hand corner of your website. From here, you'll be asked to enter your login credentials, which includes your email address and password. The "Member settings" area is where you can manage your member profile information. This area can be accessed by clicking on your name in the top right-hand corner of the website as shown below. The "General" tab is where you can enter your contact information. This will display on the directory pages and will be the information used for the communications sent to you. The "Profile" tab is where you can add a profile photo, employer name, and other information about yourself. The information added here will display in the resident directory (if available) and is a great way for other members to get to know you better! This is also the tab where you can include links to your social media pages. The "Password" tab is where you can create a new password for your member profile. The "Contact" tab allows you to edit your contact preferences for receiving emails, text messages, What's Happening emails, and forum notifications. The "Privacy" tab is where you can choose what contact information you'd like to be displayed or hidden on the resident directory and leadership pages posted to your website. In addition to managing your member profile, you have an ability to manage account information, and other members associated with your account, from the "Account settings" section. To access this area, click on your name in the top right-hand corner of the website and select "Account settings" from the drop-down menu. Below is an overview of the information that can be managed per tab. The "Addresses" tab is where you can edit, add, and delete the addresses associated with your account. The "Members" tab is where you can add and delete members on your account. You may also edit the name, profile photo, and add an email address for a joint member that doesn't yet have one included. After adding an email address to a joint member's profile, they will be able to log into their own member profile to manage their contact information and preferences. 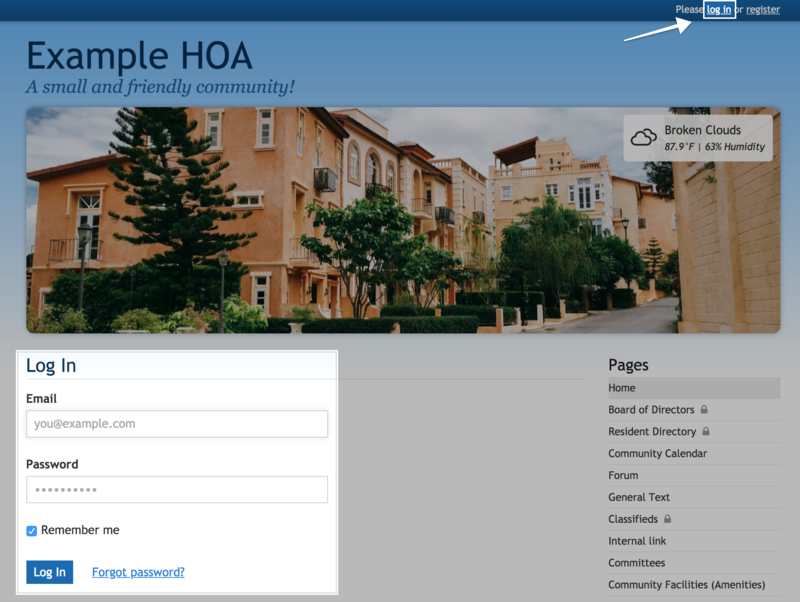 The "Privacy" tab allows you to hide certain information about your account from the resident directory or choose to hide your account entirely. You can also delete your account on this tab. The notification drop-down will display online payment options that are available to pay and surveys that are available to take. When one is available, you'll see a red notification pop-up next to the bell icon. Click that icon and select the link available in the drop-down menu to be directed to the appropriate page.